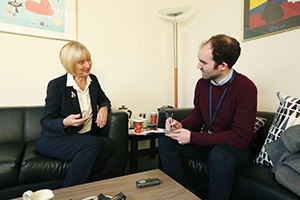 Commissioner for Victims and Survivors Judith Thompson explains how the Commission gives a voice to victims and survivors and how she is determined to make sure that voice is heard and real progress is made on dealing with the legacy of the past. 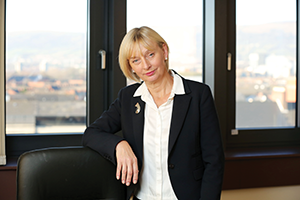 Judith Thompson was appointed as Commissioner for Victims and Survivors in September 2015. In her first five months Thompson has met numerous individuals, families, victims’ groups and politicians and entered into legacy discussions with the British and Irish governments, such is her determination to achieve progress for those who have suffered the most in Northern Ireland’s troubled past. Following a long 18 months without a Commissioner, she was aware she had to hit the ground running, but the talks leading up to the Stormont House Agreement, which ultimately failed to deliver for victims and survivors, was a stark introduction to the difficulties she now has to face in meeting political and private expectations. Yet despite the crushing disappointment of the political ‘Fresh Start’, she is sincerely positive about the prospect of getting a positive outcome after the next Assembly Election for the people she represents. In the coming months she will continue to meet with all the political parties and victims’ groups to firmly establish the significant progress she says was made before Christmas. “I don’t expect to get any agreement before May 2016 but I absolutely believe that the points of difference are not so great that we cannot make some further inroads and establish some common ground on which to give victims and survivors what they deserve”. The Commission has a strong programme of work to deliver in the next number of months not least of which is a major conference leading a mid-term review of the Victims and Survivors Strategy 2009-2019. Not only will the event begin work on a comprehensive evaluation of what has been achieved to date in Dealing with the Past and Improving Services, it will also start the vital process of looking forward to the strategic steps we need to take to implement the priorities in Building for the Future. Mitigating the effects of 40 years of conflict is a tall order for any one Commission or Commissioner, but as an Englishwoman Thompson’s credentials in understanding the nuances of Northern Ireland are not in question. Thompson believes she is well placed to understand the impact that Northern Ireland’s past had on the lives of many of its citizens. Her first job was as a probation officer in 1984 in north Belfast followed by two years working in HMP Maghaberry. Reflecting on these roles, Thompson feels that her time in north Belfast allowed her to get a good understanding of how the conflict was affecting the people on the ground. It also gave her firsthand exposure to those who had been very recently injured or bereaved. Similarly, Thompson feels her time in Maghaberry provided her with “important learning” as it allowed her to understand the impact imprisonment had on the incarcerated, their families and communities. “It was a very different place to work compared to England where I’m from,” admits Thompson. “Following my time at Maghaberry I moved into a number of managerial roles, but in 2004 I moved to an organisation that was focused on setting standards and developing best practice right across the justice system. Again this role put me in contact with people who had operational experience of the Troubles, like the police and fire service, and give me an insight into the challenges they faced at that time. When asked to talk about a typical day as Victims Commissioner, Thompson admits there is no such thing, “it’s really varied but never dull,” she claims. “Meetings between policy makers and our victims’ forum are also incredibly useful as it helps decision makers understand in a more personal way what they are dealing with and the impact of their decisions,” Thompson states. The Commission has a clear remit founded in the Victims and Survivors Order 2006. Its primary function is to safeguard and represent the interests of victims and survivors and advise Government and service providers on the needs of victims and survivors. The Strategy for Victims and Survivors sets the framework for this work, this was launched in 2009 and its commitments cover the period up to 2019. Thompson emphasises the importance of getting a strong evidence base and retaining independence from policy makers and service delivery “We carry out research essential to the capturing of victims’ experiences and we review the delivery of services on behalf of the government. 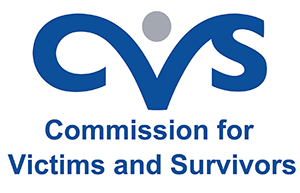 We are sponsored by the Office of the First Minister and deputy First Minister but operate separately from the Victims and Survivors Service (VSS) which assesses the individual needs of victims and survivors and provides support to meet those needs directly and through funded victims’ groups”. 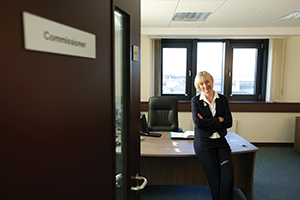 While the Commission has a small staff, they are highly experienced professionals whose skills reinforce working in partnership with the victims sector. 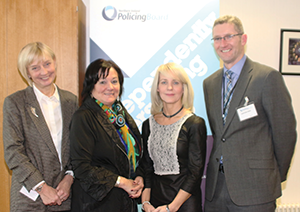 A key element to achieving this is ensuring that the work of the Commission is informed by victims and survivors. A touchstone for the Commission, is the insight provided by the Victims and Survivors Forum. All forum members are victims and generously give their time as volunteers. Obviously in representing all victims and survivors of the Troubles, Thompson has to represent and respect the differing views of some very distinct groupings. While she acknowledges that this may seem to be a challenge, she is convinced that overcoming that challenge is possible. “If you started from the very fundamental point which is the one thing everybody agrees about, that this must never happen again, and ask people if they want to see a way of building for the future that looks after people you won’t have disagreement,” she asserts. Despite her confidence in her ability to get victims’ groups pulling in one direction, Thompson admits that there is no quick solution to dealing with the problems of the past. “I think fundamentally the job of Commissioner is about trying to ease forward a very difficult process, the end of which is to actually recognise the trauma and impact of people who have been injured. It’s also bigger than that, it is about a community getting to a place where it is possible and comfortable to recognize and discuss the past and build our future. Thompson states “It may surprise all of us to know that the number of people coming forward for help and support from the VSS as victims and survivors is growing by 10 per cent each year. But perhaps it should not come as a surprise”. Previous research by the Commission indicates that almost one in three people in Northern Ireland consider themselves to be victims and survivors of the conflict. This equates to approximately 500,000 people and includes up to 200,000 adults with mental health problems, 40,000 people suffering with injuries and 3,720 families bereaved. Thompson stressed “There is no more compelling reason to realise that if we are to move on as a peaceful and sharing society, we have to deal with a painful past and acknowledge that whether we like it or not, it still affects the present. “That is why our politicians and both governments cannot ignore the importance of implementing the Stormont House Agreement and taking the time at the moment to get the legislation right in setting up the Historical Inquiries Unit, the Independent Commission on Information Retrieval and the Oral History Archive”. There is also an urgency to implement the other elements of the Stormont House Agreement including the Mental Trauma Service, pension for those severely injured, advocate-counsellor support and the implementation and reconciliation group as collectively they represent the most comprehensive set of proposals yet to address victim’s needs.